Holding her husband’s hand through prison bars yesterday, Tith Narin delivered the heartbreaking news – their eldest son was dead. Narin’s husband, Ouk Pich Samnang, was one of 11 Cambodia National Rescue Party activists convicted on Tuesday for his alleged role in a protest that turned violent last year at Phnom Penh’s Freedom Park. As he awaited what would be a seven-year sentence for joining the July 2014 “insurrection” – a conviction widely branded as politically motivated – his 30-year-old son, Heng Mesa, was passing away in hospital, having lost a battle with liver cancer. While Pich Samnang was aware his son’s condition was deteriorating on the day of the verdict, it was not until yesterday that he was brought face-to-face with the devastating reality. “We didn’t expect it. He died very fast,” Narin said in an interview at the family’s small apartment in central Phnom Penh. Having driven to Prey Sar prison in her husband’s tuk-tuk, Narin was given 30 minutes yesterday morning to break the news. Pich Samnang’s three surviving children were not granted access to mourn with their father, and Narin was only allowed to speak to him through prison bars. “On the day at the court, he wasn’t clear about what had happened. He just knew [Mesa] had fallen seriously sick. This morning when I told him, he regretted so much that he couldn’t be there that day. He cried a lot,” Narin said, gently wiping the tears from her face. Now the guardian of Mesa’s 3-year-old son, who has been left parentless, Narin said the family’s future looks uncertain. “He [Pich Samnang] asked me today for money every month to buy food, but I didn’t promise him in case we can’t afford it,” she said. With the funeral scheduled to begin on Saturday, the family’s pleas for a temporary parole have already been rejected. Now “I can only beg for help from whoever can help to let him join,” Narin said. “Our family needs him very much. Be Tealeng, director of operations at the Interior Ministry’s General Department of Prisons, said there was “no legal rule” to grant Pich Samnang leave for the funeral, and referred questions to the municipal court. The court’s president, Taing Sunlay, said granting parole was a matter for the government. Narin said missing his son’s funeral was a cruel punishment for a man that she said only ever wanted peace. “He sees a nation ruled by a party that’s not helping people, and hopes the opposition can bring change,” she explained. A protective father and unwavering supporter of the CNRP, Pich Samnang would never miss a protest, but had not allowed his children to join him either. “He never feared arrest. I always used [to] remind him that he should just keep quiet, but he wouldn’t, so I stopped being angry with him,” Narin said, her tears momentarily giving way to a smile. Pich Samnang is no stranger to the courts, or to the violence of the city’s infamous district security guards. At a demonstration in May 2014, he was beaten over the head by the Daun Penh district’s notoriously violent security forces while trying to help an injured protester. “I just wanted to help him. I didn’t have any weapons or want to increase tensions,” he said in an interview at the time. However, just two months later, Pich Samnang is said to have joined an “insurrection” that saw protesters respond as the Daun Penh security guards attempted to forcefully disperse the crowd, this time administering their own brutal beatings. His family yesterday said the activist was innocent, the victim of a political power play. 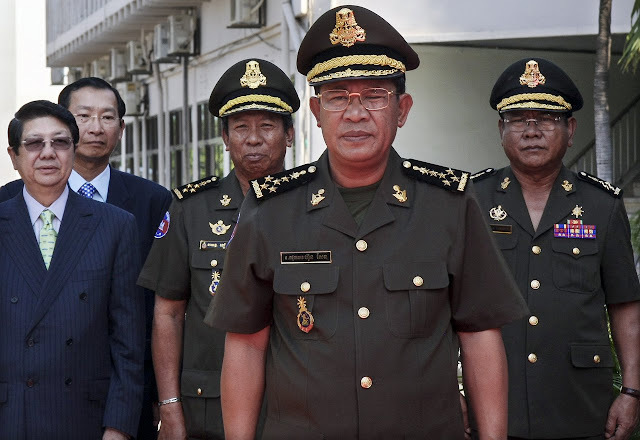 They speculated that he would likely be used as a bargaining chip by the ruling Cambodian People’s Party but were unsure “what kind of exchange could be made”. “If a leaf fell on the ground, he wouldn’t have thrown it,” Narin said. “He just wanted to help build a better country”.